NeverSeconds: Hi Veg, and friends of NeverSeconds! Hi Veg, and friends of NeverSeconds! Our school is located in New York City. It is an International School, and JAM has seventeen students from many different nationalities. Although we all speak in the same language (English) at school, we are from many parts of the world, and at home we may speak a completely different language. In our classroom we have two teachers: one is Brazilian/Italian and the other is American/Irish. I am Paula, one of the two teachers – the one from Brazil (I am also Italian). My American/Irish colleague is Keri. At JAM we eat lunch in our classroom and we bring our lunches from home. When I came from Brazil to teach at JAM, my students’ lunches caught my attention right away – there was such variety among them! I have learned a lot over the last several years, from watching what my students bring to eat. I have seen Iranian, Bosnian, Indian, Japanese, and other cuisines. I have had a student whose lunch varied with the seasons, and others who prefer to eat the same thing every day. I have had a student who would build savory crepes during lunchtime: he would take all these plastic containers out of his lunchbox and explain what he was doing as he assembled his crepes – while Keri and I would look on, amazed! Of course, our students also notice each other’s lunches, and there is a lot of learning at the lunch table, as we talk about what each of us has brought. We particularly notice the differences and smells! I introduced the children, and the parents in this year’s JAM class to NeverSeconds and Mary’s Meals. Everybody was eager to be part of what you started Martha. The parents wrote descriptions of the lunches and the children exhibited their lunches for the photographs. So everything that is written in our blog posts this week is the result of teamwork! We are also delighted that on our last day on NeverSeconds will be the International Day of Peace and we will be celebrating it at our school. We will talk about it on Friday. 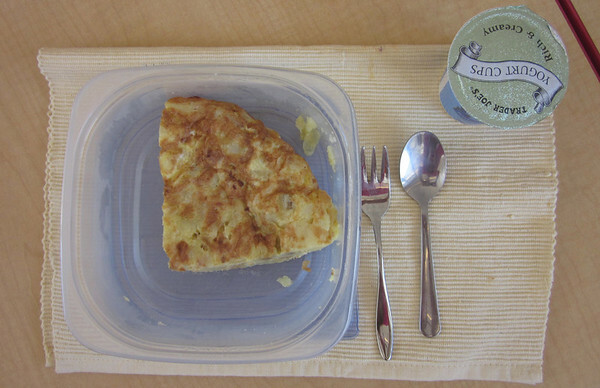 Eduardo’s lunch is Tortilla Espanola or Spanish Omelet is the most commonly served dish in Spain. It is made of eggs, potato and onion. Can you guess from where Eduardo is from? Eduardo also likes yogurt, and that’s what is in the pot at top right in the photo. 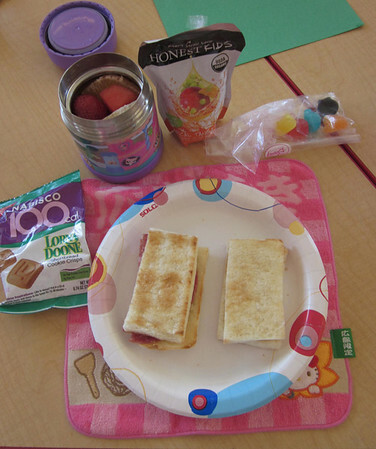 Leah’s lunch is a salami and cheese sandwich on toasted white bread. Leah comes from two cultures, half-Japanese and half-Canadian (Jewish origin). The lunch is obviously none of them, says her father: it’s an original creation from New York. Another of her favorite lunches is seaweed (Japanese) with cream cheese on it (Jewish)! She loves fruits (strawberries, today, in the small container), which make up roughly half of her lunch. She has some candy in a plastic bag, as a treat, she also has shortbread cookie chips in the bag on the left and juice to drink. Mica’s lunch (Micaela) – Estas son empanadas argentinas. Las empanadas se originaron el Galicia (Espana) y Portugal. Es ahora un plato tipico argentino. Las empanadas se suelen servir em fiestas, como entradas, o plato principal, o en festivales. Se pueden preparar con differentes rellenos y sabores. Cuando se sirven diferentes tipos de empanadas, estas son cerradas con differentes “repulgues” que sirven para diferenciarlas. These are Argentinean Empanadas. Empanadas trace their origins to Galicia (Spain) and Portugal. It is now a traditional Argentinean dish. 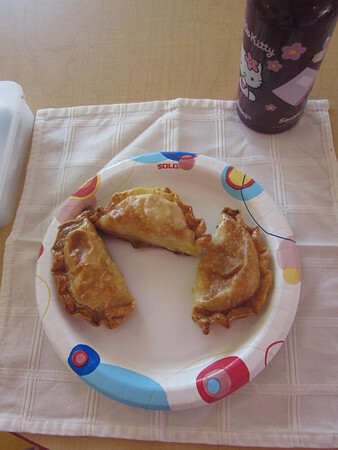 Argentinean empanadas are often served at parties as a starter or main course, or in festivals. They come in many flavors and fillings. When several types are served, a “repulgue”, or pattern, is added to the pastry fold to differentiate them, so guests can tell them apart. Eating with the mouth closed: we did great! Tomorrow we will see the lunches from four other classmates! See you tomorrow! What a great post and description. Thank you! This is fantastic, I can't wait to see more of the different lunches from each of the children this week! The lunches all look delicious. Very cool that we get a variety of lunches to look at this week. Thank you for sharing and writing in such detail! I want to try Mica's empanadas. What filling was inside them today? Tortilla from Spain and empanadas from Galicia. What a great post :) . I wonder why You dropped the "Healthy" aspect. Wouldn't Kindergarten be a great place to start teaching some awareness about healthy food? Is there any food exchange going on between Your pupils? With so many different meals from different countries they could get interested in how all those things taste. Hi, during lunchtime we don't encourage the children to exchange food as sometimes the children may have allergies to different things. However, we have an International Food Fair here at school, which is when the children are invited to try food from the different countries, when accompanied by their parents. About dropping the health rating - the children and I discussed what they wanted to rate and I actually let them decide, but you are correct, Kindergarten is a great place to start awareness of healthy eating.